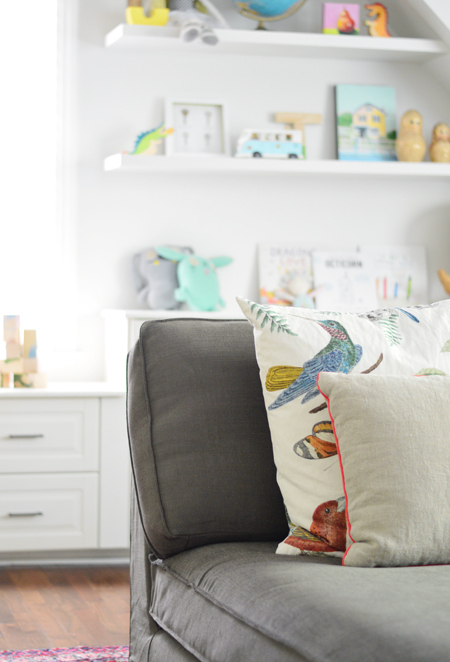 If you missed what got us to this point (and are wondering where the heck this room is), you can catch up on how we finished this unfinished storage space above our garage, added built-ins & shelves to fill the nook, and made a wire-free spot for the TV. It’s hard for us to even remember that it looked like this back in January. 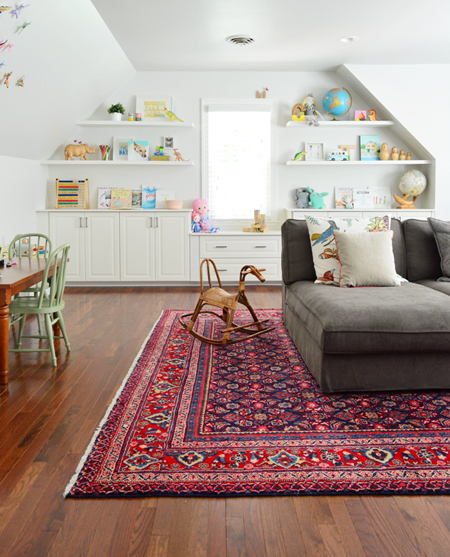 Overall, we wanted this room to feel fun and casual, and act as a bonus space for the whole family to enjoy. We’re learning more and more that it’s helpful to have a contained play area for the kids (i.e. not the door-less living room) and to have a shared play space upstairs (i.e. not one of their rooms). 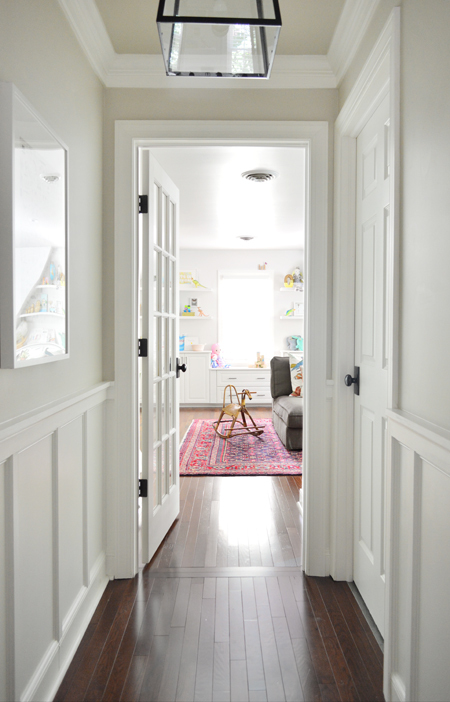 But we’ve been hesitant to call it a “playroom” because it also serves us grown-ups. It’s great for movie nights, it sleeps our overflow guests, and even works out as a quiet space to sneak off and read (did I mention the door is one of my favorite features?). 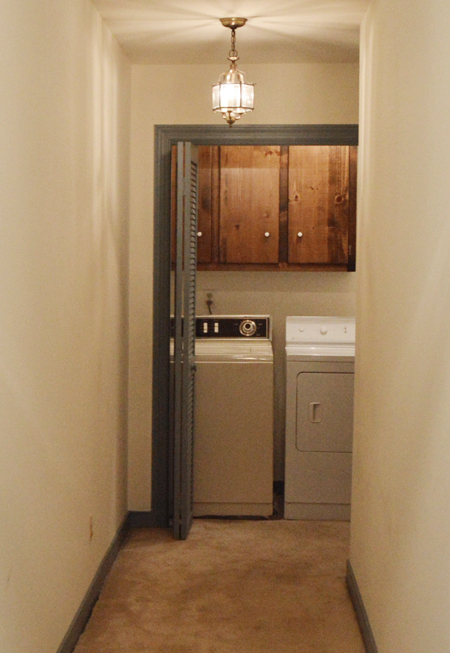 All but the dress-up corner and the wall of storage are visible in the photo below. The desk and chairs were the luckiest hand-me-downs ever scored. 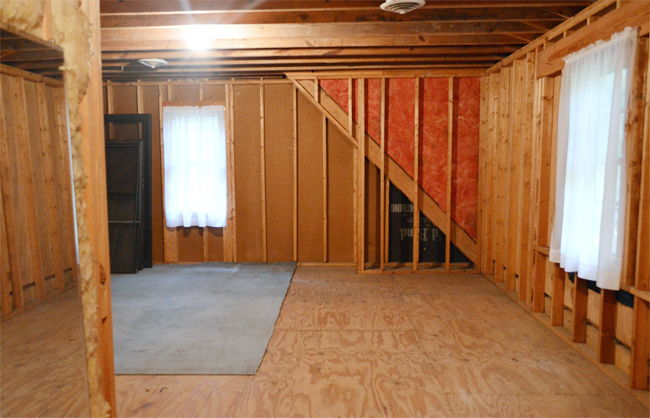 When our neighbor heard we were adding a bonus room over the garage like hers, she asked if we could put them to use because her grandkids had outgrown them. They’re from Pottery Barn Kids, and the chairs reminded us of our painted spindle-back chairs downstairs. The art is by Cat Coquillette (serpent | llamas | narwhals) who is one of our favorites for intricate and colorful art with awesome subjects (she also has donuts, cicadas, and a venus fly trap). 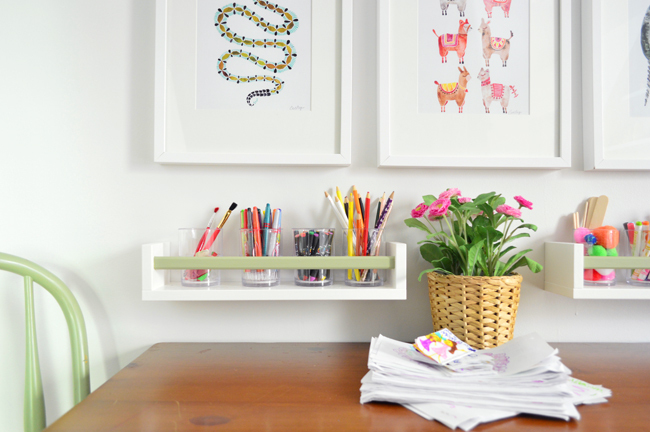 The little art supply trays were wooden spice racks from Ikea that we painted white, and then added some green to the front bar to tie them into the chairs. Coincidentally, that’s actually green touch-up paint that we had leftover from our dining room buffet, which was a ridiculously close match to the chairs. The clear plastic cups for the pencils, crayons, markers, and other art supplies were from Target. It was somewhat of a challenge to find containers that were small enough to fit, but when we realized a small soup can fit perfectly it became our reference point when we were out shopping. Bigger than the soup can? No dice. Plus, I kinda liked making Sherry tote around some chicken noodle in her purse at all times. Next door to the art desk is the teepee, which we second guessed a few times because teepees felt, I dunno, kind of clichéd? But it turns out that so many people have them for a reason: kids love them. 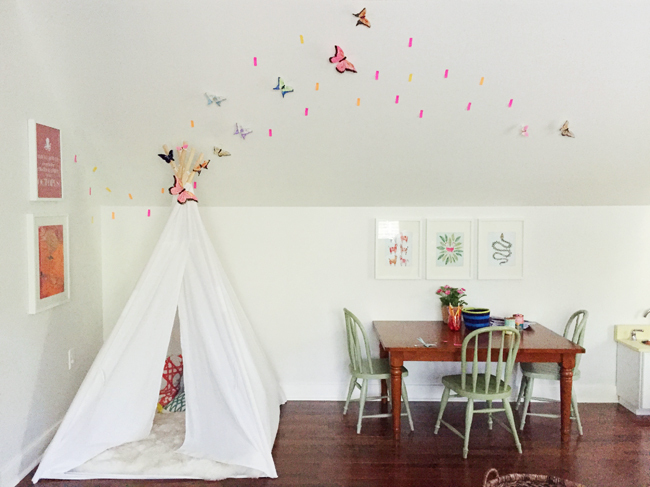 We asked a few friends if their teepees actually got used before buying ours (One answer: “every. single. day.” Another answer: “Yes, all the time if you put something cushy on the floor in there”). So we went for it. We bought this basic white one and added a large faux sheepskin rug to the bottom, making it comfy for the kids and apparently prime napping real estate for a certain chihuahua as well. 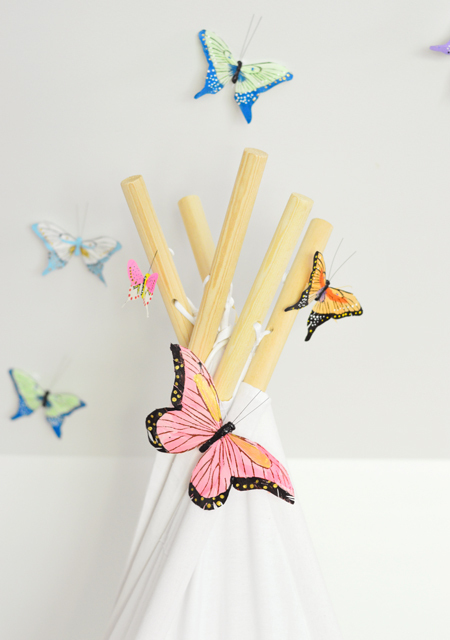 The teepee also comes in other patterns/colors, but we should point out (since it’s not clear from their photo or ours above) that it’s actually FIVE-sided, so it can even get a little larger. We found the pentagonal footprint harder to fit into the corner, so we basically just squished two of the back poles together to make it four-sided. I’d say it gets at least daily use and one of the kids’ favorite activities these days is going in there with two flashlights. They pull the fabric flaps closed behind them and it pretty much looks like Studio 54 from the outside with all the flashing and swirling lights that go on. All it needs is a disco ball. We did hang one of these Ikea LED lights inside (the cord runs outside along the back of the teepee between those two squished-together poles) since we quickly learned that “blinds closed, room lights off, teepee light on” was a favorite combination (it nicely complements a flashlight dance party). You may have seen a picture with the teepee light on in our Instagram feed a few weeks back. So let’s talk about the butterflies. OH THE BUTTERFLIES. This was an idea that Sherry had mentally squirreled away after we moved the butterfly/bird pillows from our guest room in here. 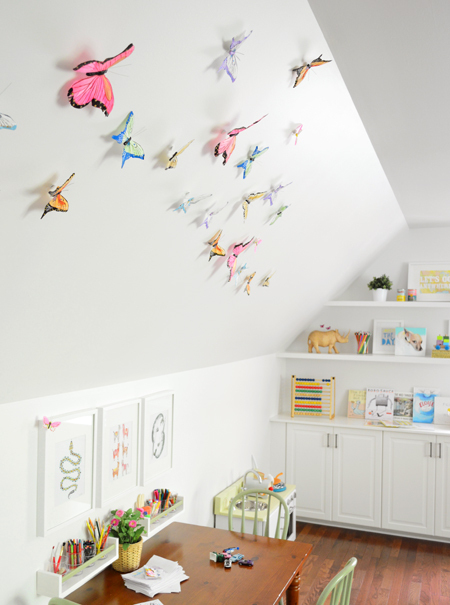 But it was buying these feather butterflies on clearance at Pottery Barn Kids that helped make it happen. Even before they arrived at our house they were sadly out of stock, but there are lots of options on Etsy like these or these. We mapped them out on the wall using post-it tabs first, since it was an easy way to move things around and figure out the general shape we liked best. 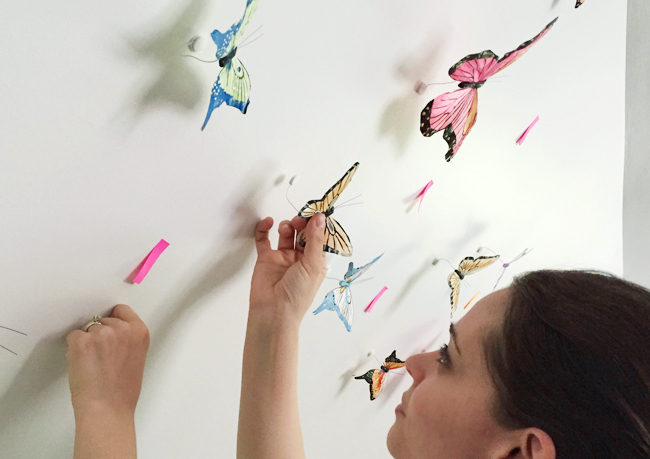 Then we just started swapping them out for the butterflies one-by-one, fine tuning as we went. Each came with a little 3M adhesive circle on the end of a bendable wire. The 3M makes them removable and the wire is nice because once placed, we could still adjust their position a bit. The wire also gives them some dimension since they float away from the wall a little. 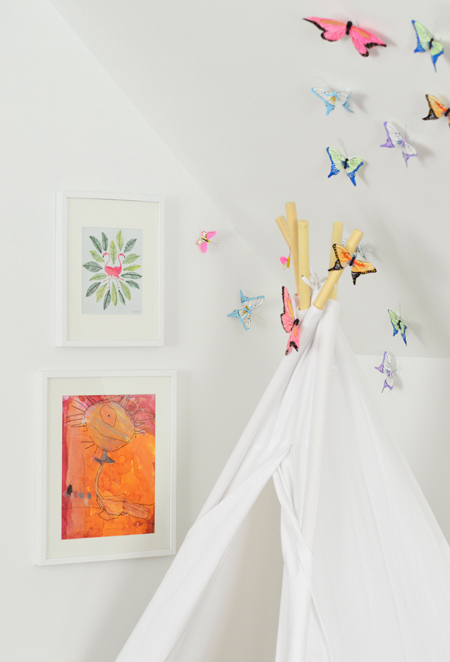 It probably goes without saying that the kids gave them a giant stamp of approval (bugs and butterflies are a hot topic these days) and, heck, we liked that they made use of that weird, sloped wall. Oh yeah, and there’s one more Cat Coquillette print anchored by a monster that Clara painted a couple of years ago. If you were to spin yourself around while standing at the art desk, you’d see this. Our big patterned rug (more on that here), our wall mounted TV (we bought this one and explained how we hid all the wires here) and our big comfy Mega Sofa-Thing. At least that’s what we’re calling it. It’s actually three Ikea Kivik chaises that we attached (they come with little clamps to secure them to each other) aaaaaaand…. it’s basically our new favorite spot in the house. Originally we contemplated moving our living room sofa (an Ikea Karlstad) in here and getting a new sofa for downstairs, but we’ve still got a few more years of snacks / sticky fingers / spills to contend with down there, so it felt impractical to upgrade that sofa quite yet. And since it has held up so nicely for us over the last 5 years, we didn’t hesitate to turn to another Ikea sofa. 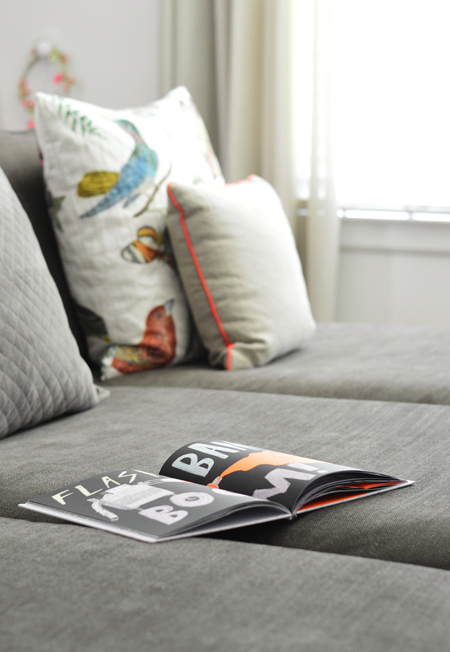 When we saw a trio of Kivik chaises sandwiched together in one of their catalogs we realized it could be a perfect solution for our large bonus room. 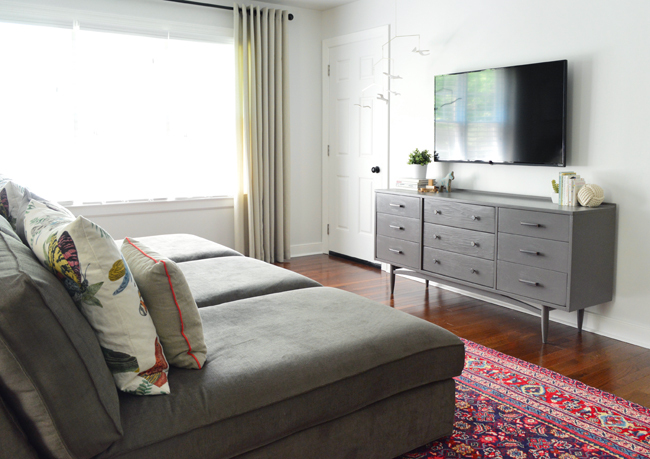 We chose the “gray-brown” slipcover and we really love it. 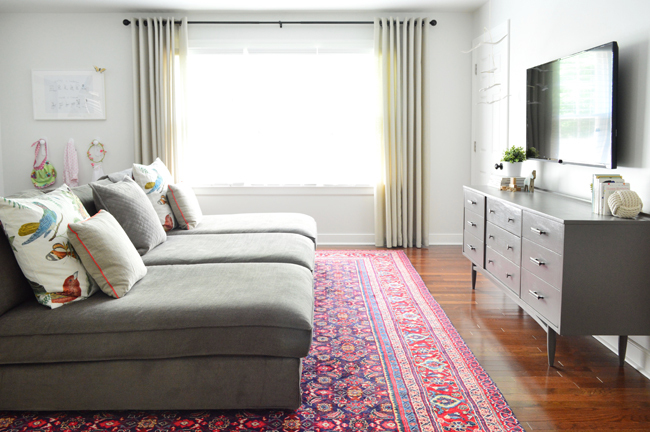 Kinda makes us want to change out our dark gray slipcover in the living room for something similar but they don’t make ol’ Karl anymore (whyyyyyyyyyyy?). Already in its short life in our home, Mega Sofa-Thing has hosted a ton of family movie nights and no fewer than four sleepovers. As you might recall, one reason we finished this room was because several of our out-of-town friends outgrew our guest room as their broods expanded. So the mega-couch transitions to a bonus “guest bed” with the simple addition of a sheet, blanket, and pillows. But I’m probably the person who has clocked the most zzzzs on it so far, since it’s my go-to spot on weekend mornings when the kids wake us up before I’m ready to officially seize the day. You know, when I’m more in the mood to zzzzs the day. We also hung some dark curtain rods from Home Depot, and bought these ivory curtains in the 95″ length. And after stealing the bird/butterfly pillow shams we originally bought for our guest room, we picked up two of these smaller neutral pillows with orange piping. 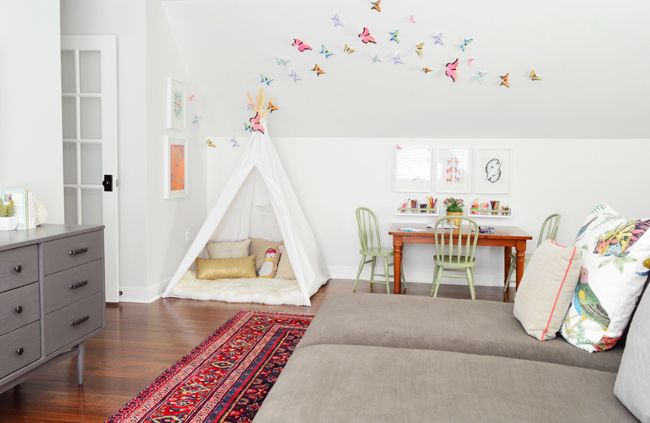 Behind the couch, tucked in the corner next to the built-ins is the dress-up corner. Since our collection of costumes, capes, weird hats, firefighter suits, and vet tech outfits (yes, we really have one of those) had been overflowing the bin in the downstairs toy closet, this felt like a smart place for them. And it’s amazing how much more use they’re getting now that they’re out in the open. My Saturday morning post-wake-up nap is often interrupted by a crown or a cowboy hat finding its way onto my skull. 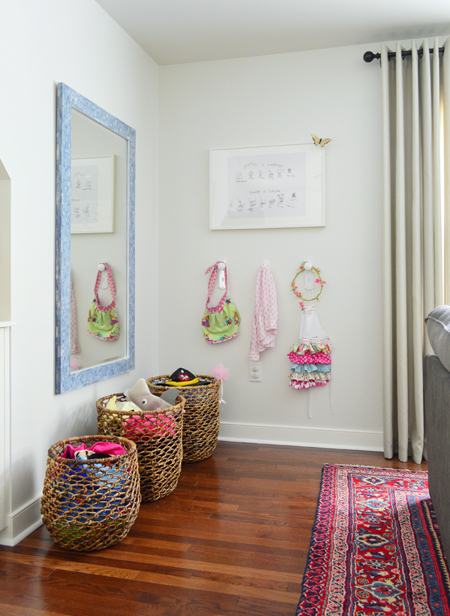 The baskets and blue inlay floor mirror were from HomeGoods ($429 marked down to $199!). 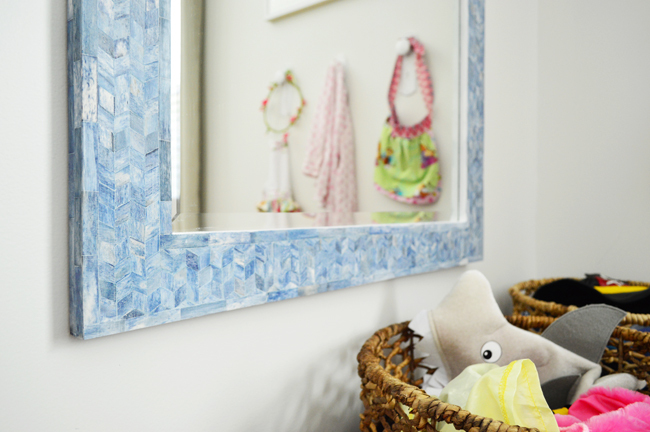 The mirror might be the secret weapon in “The Resurgence Of Dressing Up” in our house (there’s just nothing like gazing at yourself in the mirror with a shark on your head). 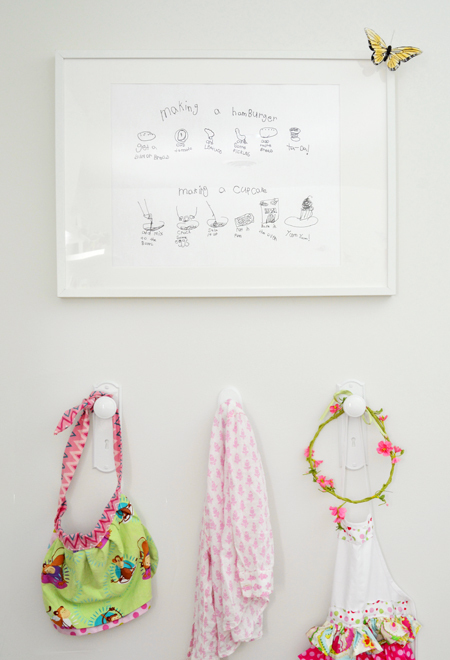 We also created a spot to hang stuff up using some of the doorknob hooks we designed. And we hung a piece of artwork above them that we made out of some of Clara’s old “recipes.” We snapped pics of them with our phone, used Photoshop to size and arrange them, and then got a $1.79 engineering print at Staples. 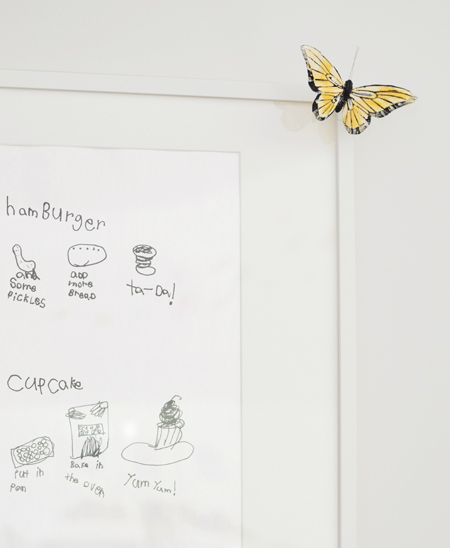 It’s kind of hard to see in the picture above, but I love that her recipe for a hamburger involves only toppings (no actual burger) and finishes with a “ta-da!” Like it’s the end of a meat-related magic trick. Overall, it has been an awesome bonus space to use in the mornings, at night, on weekends – pretty much whenever. 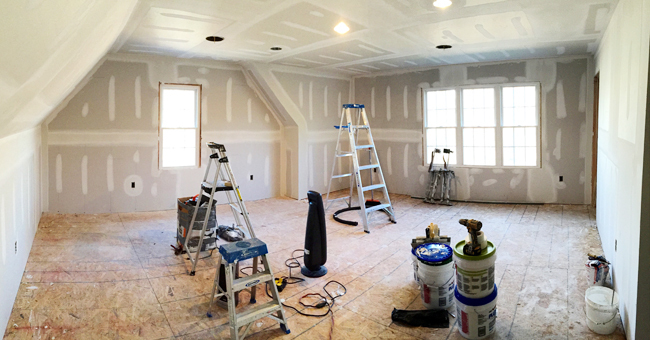 When we first finished it (aka, drywalled but not furnished) there were a couple of weeks where we second-guessed having jumped into this project, since our routines didn’t seem to be adjusting to include going in there at first. It felt like dead space except for the occasional “kids running laps” (and that novelty eventually wore off). But sure enough, it just needed time and, well, a little more stuff to actually do/sit on/look at. Speaking of stuff, we didn’t really buy a lot of new toys at all, we just moved existing ones in here so they get more action. 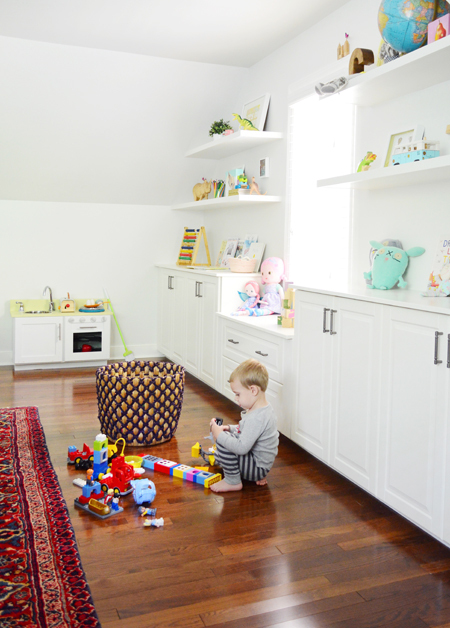 The play kitchen came out of Teddy’s closet and has gotten a lot more communal use in here. We split up our giant Duplo stash so they can be enjoyed both upstairs and downstairs. And the lower cabinets in here make accessing puzzles and kids games a little easier than on the high toy closet shelves downstairs. 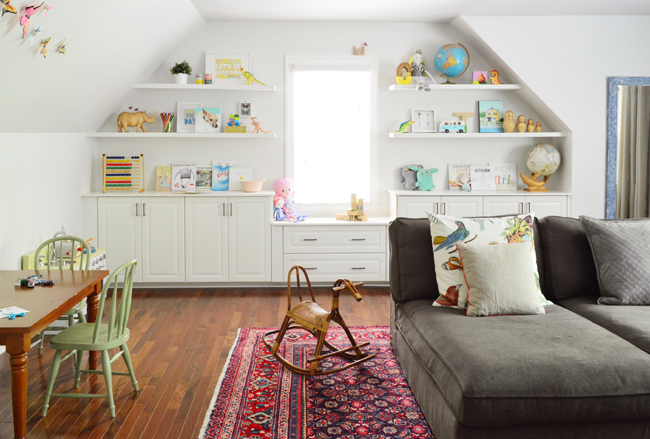 We’re just glad this room didn’t turn into an excuse to accumulate ALL THE TOYS (although we did just celebrate two birthdays, so there’s that…). Now if you’ll excuse me. I have may or may not have some important sprawling out to do on a certain trio of chaises.